If that summer day of 35 years ago I had kept on playing in the backyard, rather than accompanying my friend Bonnie and her father to a nearby bar, I would have never discovered the object that changed my lifestyle: an 80s arcade machine! Neither my parents nor my grandparents would have ever taken me to a bar and – less than ever – allowed me to look at an arcade machine from a playing distance. 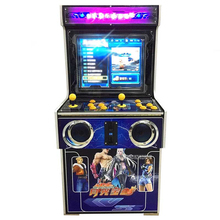 – For the few (hopefully) who do not know what an arcade machine or cabinet was, well, it was a game machine that you could find in public businesses such as restaurants, bars and amusement arcades. It was because of the obsessive heat and the half hour spent playing football that Bonnie’s father decided to go to the bar to buy ice cream for the kids there. I was about to say no, overwhelmed by shyness and the notorious dislike of my family for bars, but my grandmother, even though unhappy, prompted me to go in order to not leave a bad impression. He was going to buy me ice cream, after all. Just got off a spacecraft – is this an alien? I did not understand much of the barman’s explanation and I guess he was probably repeating a definition learned by heart. Regardless, the more I looked at those scrolling images featuring a little man climbing a building, while trying to avoid being hit by flower pots, the more I wanted to help him. Grounded but happy! – I had to play it! 1. Bonnie’s father had just paid for the ice cream tubs and we were set to leave the bar to go home. 2. Playing the video game was not for free. The barman was quick to tell me, as soon as he saw me messing around with the stick and the buttons in the hope of starting a game. I was only 6 years old and obviously I had no money with me. Bonnie’s father was my only hope, even though it meant sure punishment from my parents! One of the strictest rules set by them was to never ever ask for money from anyone and for any reason. “I will happily be grounded”, I told myself. I therefore decided that I would ask Bonnie’s father for money, adding that my granny would then give it back to him. Unity is strength – kids’ power! My request for money to his father gave her the courage to join my “battle”. At that point, John could just not say “No” to his beloved daughter and so we went back inside. A proper clarification before continuing: yes, you read that right… 10 cents, incredible, uh? 10 cents were enough to buy a ticket to Toyland. Bonnie inserted the coin, but she let me play first; maybe she was afraid to fail. I could not care less instead, I just wanted to play and finally, it was time. Right when the first stage was about to begin, I heard John giggling with the barman, with the latter claiming that he had tried to play the game but had quit after 30 seconds. He went on to say that he did not even know how to move the Crazy Climber (I knew he had quoted somebody else’s explanation verbatim). It goes without saying that he predicted the same outcome for us. If on one hand my first life lasted 30 seconds (just like his), on the other one I was already completely enraptured by that virtual world. The first click of the stick was enough for me to understand that I had got into video games. For the record, Bonnie’s attempt lasted less than 10 seconds, after which she kindly left me the third and last life. My second attempt lasted almost a minute, this time. I managed to climb a few floors, before being hit and sunk by a flower pot. After that, we left the bar satisfied (at least I was) and we headed home. The extended stay at the bar had lasted no more than a couple of minutes, after all. In addition to that, the ice cream had not melted and I was delighted by that short but incredible experience. I ran home in the hope that my grandmother would not follow me, but it was a vain hope… She basically entered the house with me and I had to sit through a half-an-hour lecture from her. She said I had done something really bad, I had embarrassed my family and above all I had embarrassed myself… Long story short, she immediately informed my parents and I was preemptively banned from going out. Unsurprisingly, my parents grounded me for one week – which can be very frustrating during Summer holidays – but unexpectedly, the punishment backfired them. I spent the whole week obsessively talking about that arcade machine and the Crazy Climber game. When the longest week of their lives ended, my father was dejected, to put it mildly. The first thing he did was open wide the door and let me out. What a liberation it must have been! This was my first encounter ever with a gaming machine, what was yours? I really enjoyed reading your post, I found your post entertaining as well as informative. You are a very talented writer, I look forward to reading more of your posts very soon. Thank you so much Jeff, I am glad you liked it. You know, I realized storytelling is easier when you go with your heart. I will do my best to keep entertaining you. I love your post here 🙂 I think we can all relate to that penned up feeling when we are grounded but our heart is somewhere else. Me and my husband love playing the old games and luckily for us, we have an arcade near us that strictly stocks them. Looking forward to learning more . You lucky guys, I am so envious, hehehe. They eventually took me to the bar… Soon I will talk about it. What a cool article! I really miss those days of going to the local arcade in the mall. I’d spend hours there. Good times! I am with you Kevin, I miss those days every single day… Stay tuned for some more stories, I have just opened the chest in my retroloft. Wonder how much that retro game would be worth today! Yeah, not only the retro game, the machine itself costs a fortune. I say “cost” because I have been saving money for a while in order to buy one, stuff it with old games and place it in my living room. Thank you very much for your kind words, I am glad you liked this retro story. Excellent storytelling! I was right there with you at the bar—scared, but knowing I would have to play the game. I love video games. When growing up we had an Atari and it was great fun when my mom would play a game with us. Love your site!! Hey Karin, I remember you! we exchanged a meaningful look before I started to play. Hehehe, here comes another natural-born gamer, glad to have you here. Like I said, my parents were not really into video games, yet there were times where they would sit and play with me. I remember them fondly. Wow, many people here are still excited on the old game. I miss my tape game so much. In my country, very difficult to find the old game machines. They all are in my memory. Hello Mong, thanks for dropping by. This is basically happening anywhere sadly, original arcade machines are slowly falling off the face of earth. I envision them succumbing to dust and rust, stocked in some huge, anonymous warehouses. This is one of the reasons why I decided to create this blog: our memories will make them immortals. Agreed Laura. I cannot deny I happen to play today’s games as well – I am an all-round gamer at the end of the day – but they have made things harder for the old generation. All very technical and competitive today, little room for spontaneous approaches. I am glad you enjoyed my article, stay around for more Retro Stories. What A fabulous site! You remind me of my son! He is a struggling you-tuber. He plays video game endlessly! He has a tee-shirt that I bought him that reads: Internet was down today, thought I would come outside! I’m going to show him this site. Hello Virginia, grateful for your comment. Thanks for promoting me hehehe, I hope I can live up to your son’s expectations and be able to entertain him. Now I also want that shirt though! lol. I thoroughly enjoyed your ’80s arcade game story. Yes, you are a good writer…I was hooked from the first and had to read the rest. This is a great site and I can see many people getting wrapped up in your tales and loving your site. Thanks for sharing with us! Hello Fran, thanks for your nice words. It is my pleasure to entertain you guys. The 80s were unique! That is when the technological revolution began and we were all so naive. We just cannot let those years being forgotten… Stay tuned for more Retro Stories! Hillarious! Great read, thanks! Have times changed? So much stays the same! Arcade machines were viewed with suspicion, just as VR games are now. It takes a while for new technology to take off, and we can’t all see the future of it. But some of us get it from the start. Most people couldn’t see where video games could go, neither did many see the future of mobile phones at the start either! Hello Lucy, I am glad that you enjoyed my Retro Story. You have got a valid point here and based on it, I am glad I got it from the start… We are proud members of the “far-sighted club”, hehehe. You know, I am a natural-born gamer, so VR games are on my radar. They are arcade machines’ grandnephews after all. Sky is the limit and maybe one day we will also be able to play retro games through VR… What a mix it would be!!! Stay tuned for more Retro Memories! Them were the good old days. I remember playing pac man in a pizza joint back in the 80’s. Nothing better then eating some pizza and sitting down at this load big machine and playing the game. I also enjoyed playing tetris and pin ball machines as well. I love those old machines wish there were more of them around these days. Hello Cory and thanks for stopping by. That said, in my small way I will try in every way to keep our heydays alive and I hope you will stay tuned for more Retro Stories. Such an entertaining article,sorry that you get grounded am so sure your mind was somewhere else all those times, I enjoy reading your post and it was easy to picture the whole scene. Arcade games in the 80’s was like heaven on earth for kids and am so sure you miss those days. I hope you will post more “arcade stories” soon. Hello Clement and thanks for your nice comment. I like your definition of those years and yes I miss them a lot, but I created this blog with the intention of keeping them alive. Thanks again for your encouragement, I will do my best to provide all of my readers with quality Retro Stories! Thanks for your article down memory lane. I too remember the early arcade video games, although I was older than six years; the first video game I played was something called PONG, by Atary. A few years after, Pac-Man came into being, and that was all the rage in terms of video arcade games, at least for a while. A that time I was the proud owner of an Apple II+, and I soon discovered that I could purchase a Video Game on disk, take it home, insert it into the floppy disk drive, and do without having to go to the arcade parlor. Big step ahead, since it also allowed me to play and loose at will, without the need to drop another coin. No more “one coin one game” for me…! I know where you are coming from and I probably felt the same way at some point in the past, but in hindsight, the arcade was a way of life to me. As another commenter (Cory) said: “Nothing better than eating a pizza and sitting down at this load big machine and playing the game.” I could not have said it better myself… Yes I could play some of the same games at home, I could host a tournament, invite some friends and have fun together, but arcades were and will always be my favourite haunts. Thanks again for stopping by and please stay tuned for more Retro Stories!